Attaining great vocabulary doesn’t mean you use the “highest” words all the time. Malcolm X knew how to shift his vocabulary for his different audiences. They say that the Inuit peoples have seven different kinds of words for snow. Hey, if you are surviving in the Northern regions it’s helpful. Is it the soft powdery stuff or the crunchy hard, bite through your face stuff?. An increased vocabulary gives you the capability to have more pigeon holes to understand the world. I was so fascinated that I went on—I copied the dictionary’s next page. And the same experience came when I studied that. 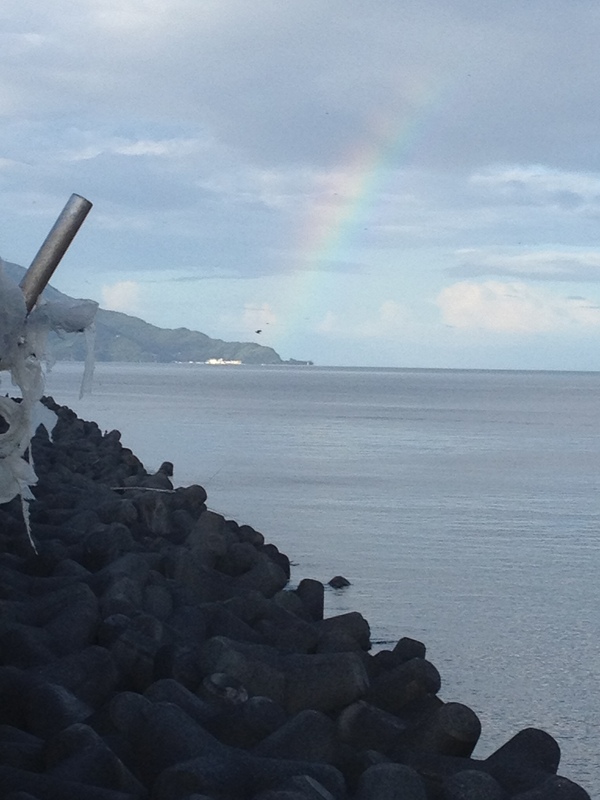 With every succeeding page, I also learned of people and places and events from history. Actually the dictionary is like a miniature encyclopedia. Finally the dictionary’s A section had filled a whole tablet — and I went on into the B’s. That was the way I started copying what eventually became the entire dictionary. Malcolm X became a word warrior and traveled the world because of his ability to learn. You don’t have to go prison to become a word warrior. 🙂 . However, what X’s story reminds me of is the importance of moving between intentional word study and reading for joy, enlightenment, transformation, etc. 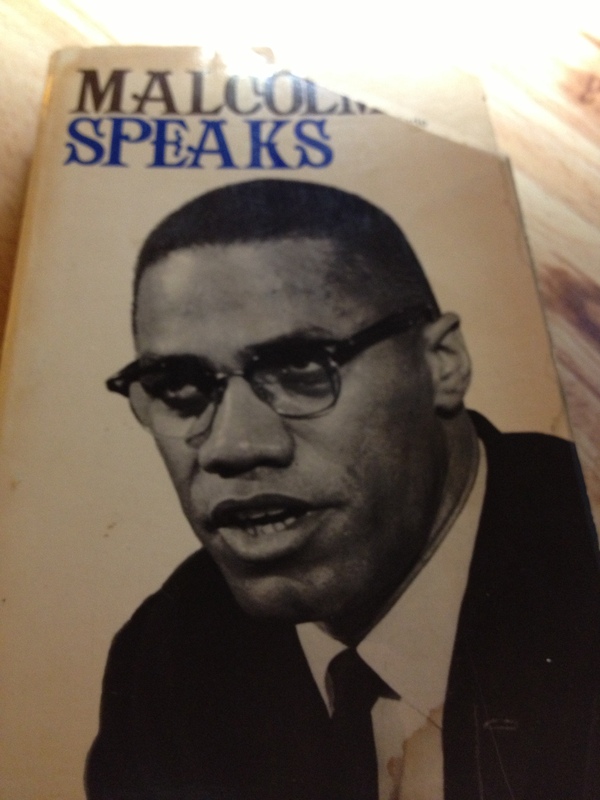 Malcolm X started by being highly motivated to read and write texts that inspired and informed him. 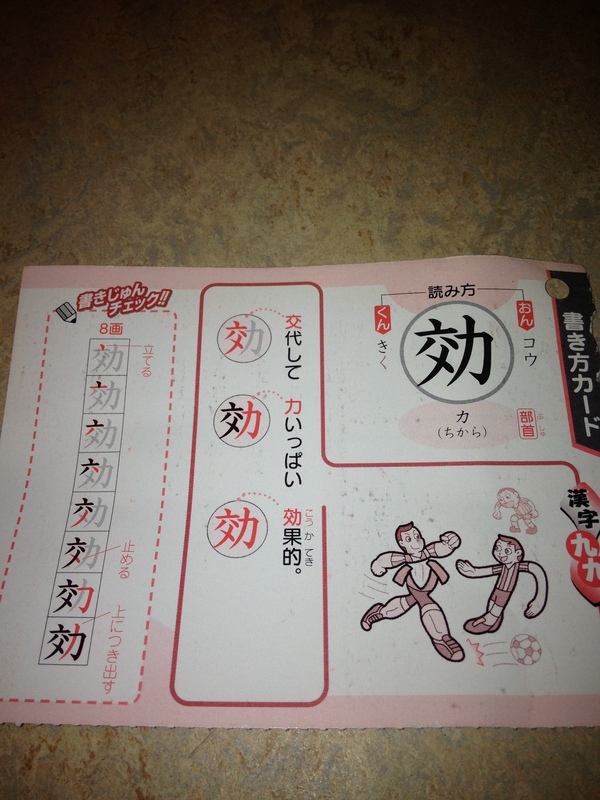 Frustrated by his word power he went all samurai by copying out the dictionary. (That’s not the only option for developing word power.) His increased word power allowed him to read more, which in turn increased his word power. 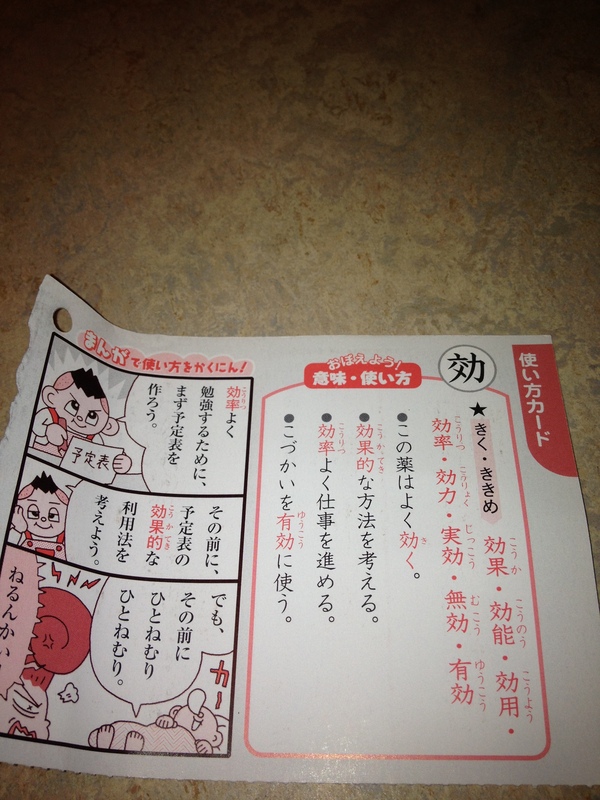 When I have a short amount of time, I study using the iPhone with Midori. I collect words from reading, listening to music, etc. There’s a flashcard program but it only focuses on single words rather than sentences. Learn a word, but don’t bother learn that word. Learn new things, but don’t get hung up about anything in particular. Don’t get stuck on a specific word; don’t have one-itis for any specific word. Screw it. Pick an easier word. Pick a word that’s…I dunno…”giving it up” easier, as it were. 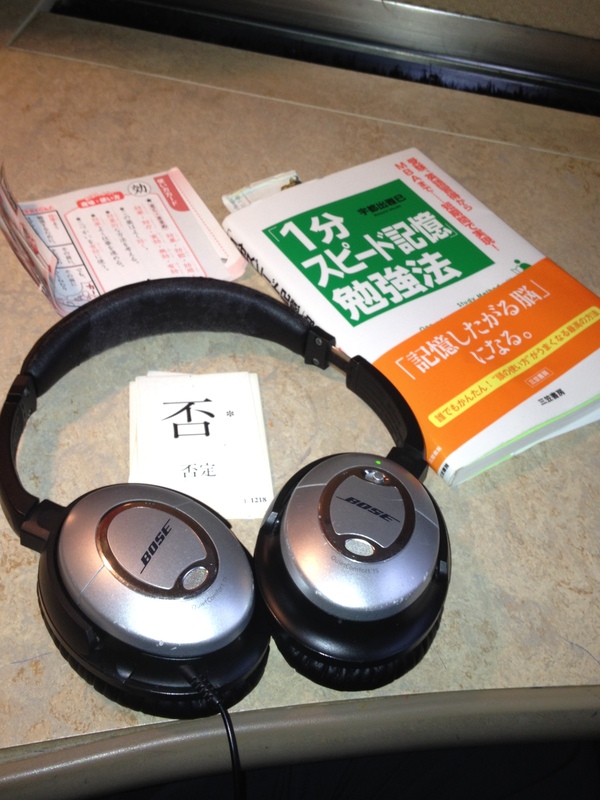 In the mornings, I do all kinds of word study through Surusu, Anki, Japanesepod101.com, and iKnow. Throughout the day, I do repetitions of the words I’ve studied–or not. But what is really important is that I have books and media that move me to be hungrier to play with words more–my Youtube music and drama lists, DVD’s from Netflix, my man-bag books, podcasts etc. Push. Relax. Push again. Connect. Free your mind. Word up. I love it when a song pops in to your head and it fits what you’ve been thinking and reading about. Enjoy yourself (it’s later than you think). I just discovered the Louis Prima version but I was introduced to the song by a ska group called the Specials. A big part of learning involves controlling and nurturing your environment and ensuring that you will both push and relax into your hoped for skill. In the morning I create and study flashcards and all that other Silverspoon-push stuff. In the off moments, I may be listening to Japanese music or watching snippets of Japanese youtube videos. Then, I “read” my Japanese books. I may read every word on every page or just read the chapter headings or the table of contents. I don’t worry if I know every word. 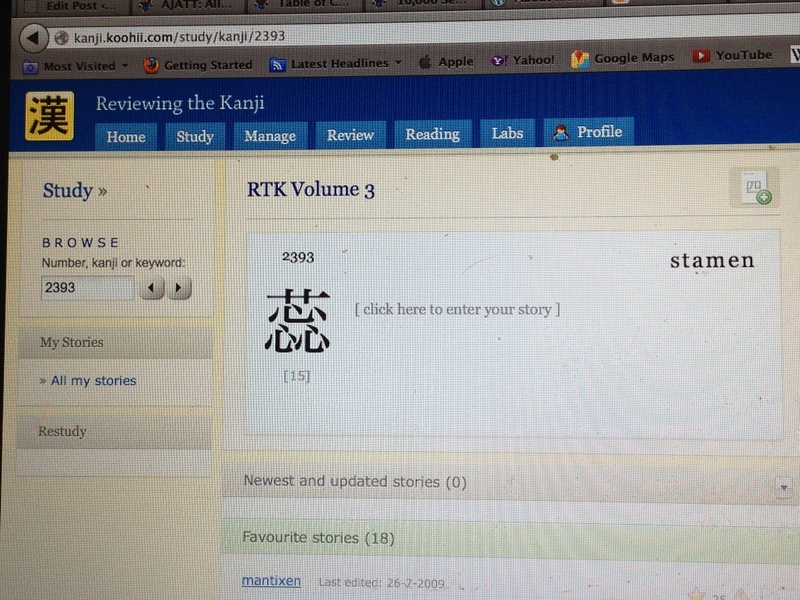 I may look at a new kanji compound and think, “Wow, I haven’t seen you before.” And then, I move on. 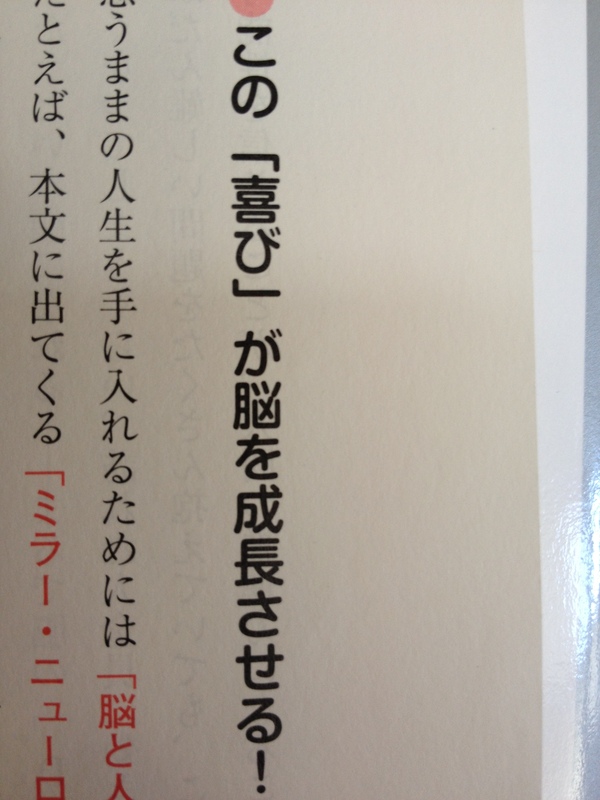 I’m light years away from where I was months ago, when a page of Japanese text put me into a cycle of self-loathing. Begin by being nice to yourself. Be as nice as you would to a child learning to walk. Think in terms of games. I just realized that some people have crosswords and sudoku and I have kanji. 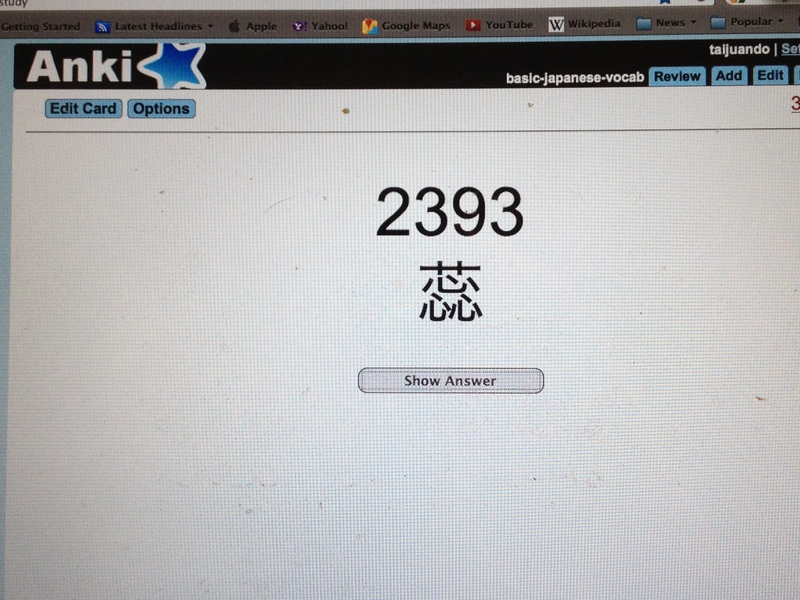 I’m not going to master “kanji” I’m going to play kanji. Find the teachers and tools that you enjoy or at least choose to enjoy your teachers. Currently, I am watching Steve Eulberg’s lesson on the Circle of Fifths on Jamplay. (They have a sale in December! Follow the link on the right) It’s wracking my brain but, hey, I like the guy. Make time on your side. Use timers to turn the “pushing” part of your day. Lately, I’ve been going at the Japanesepod101..com lessons (check out yet another link on the right) but using incremental and decremental timers (an AJATT tool) to make it all mission-impossibly fun. It’s also part of adding speed to my game. Let yourself play and play “bad.” I’ve been playing a lot more guitar since I’ve given myself the opportunity to play badly. In fact, it’s been liberating to give up. Nope, I am not going to play like Keith Richards tomorrow. But I can practice this G scale pattern and noodle around afterwards. I’m glad we all survived the apocalypse. But the timer is still ticking. Enjoy yourself. It’s later than you think. 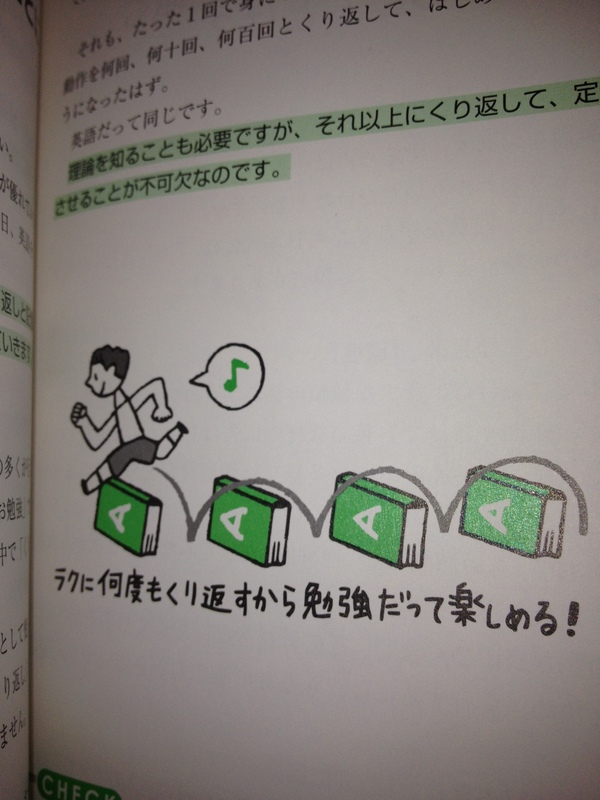 I’ve been dipping into this book by Masami Utsude about adding speed to your learning methods. He recommends learning English by watching and reading materials that you enjoy. Good advice for learning any language! As part of my Japanese immersion project, I have Japanese books stashed all over the place: in my man bag, by my bedside, by the computer, etc. At the Writer’s Room, where I spend 45-60 minutes each morning studying or working on my writing, I have several books. 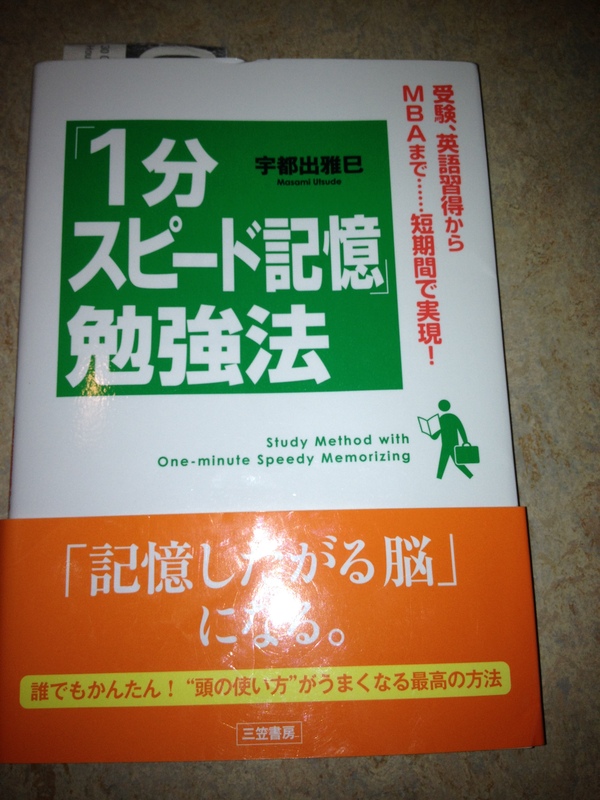 At the top of the pile is １分スピード記憶勉強法：　Study Method with One-Minute Speedy Memorizing by Masami Utsude. I dip into this book every now and then because it is simply laid out, has a lot of pictures, and is inspirational. Unless the text is completely compelling, these days I am choosing Japanese books with pictures. 1分　has a lot of fun pictures. This one emphasizes that it is more fun and easier to learn a foreign language through quick and repeated reviews. Utsude argues that one of the main reasons Japanese people don’t learn English is because they don’t give themselves enough opportunities to read, speak, and hear English. The best way to actually review is to read, speak, and hear materials that you enjoy in a foreign language. Utsude explains that you wouldn’t expect to become a better swimmer by reading a book and getting into a pool once. To become better you need hundreds of hours of actual practice. Utsude was writing about English but you can fill the blank above with any language or skill you want. Your Self (自身） Are you clear and confident in your goals and motivation for learning a foreign language? It’s the infrastructure issue all over again. Masami Utsude urges his readers to “review” while having fun learning from English dramas, movies, newspapers, etc. It’s the reason that I am reading Japanese books about learning. I have a natural motivation that keeps me motivated and moving forward. No birds. No stone. Watch without subtitles. Even if you don’t understand just enjoy the atmosphere of the movie and let it fill your heart. Repeat scenes that you love over and over again. Let yourself feel like you are part of the movie or drama. “Shadow” the dialogue and repeat what they say. 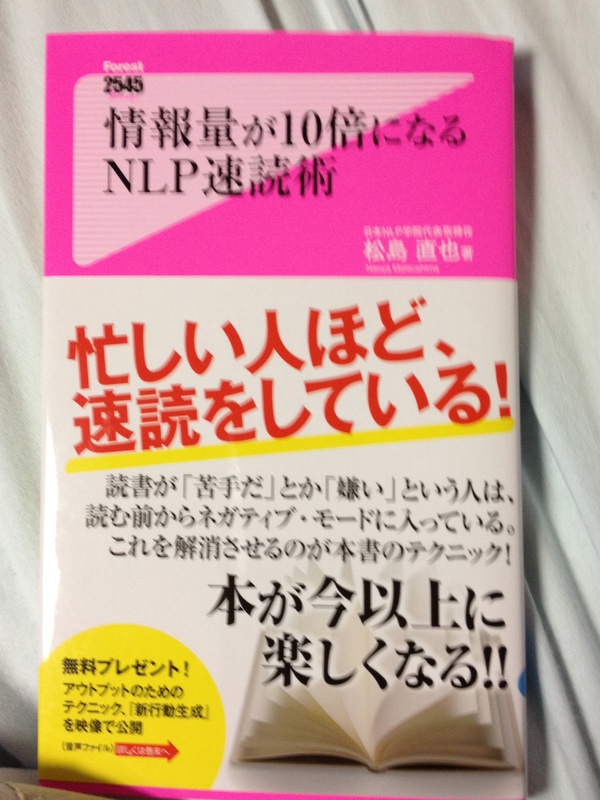 1分スピード記憶勉強法　has a lot more great ideas about learning foreign languages. If you are a follower of AJATT or antimoon, these ideas are not new. In a way, that’s why I chose the book–because it affirms messages that I already understand and know. 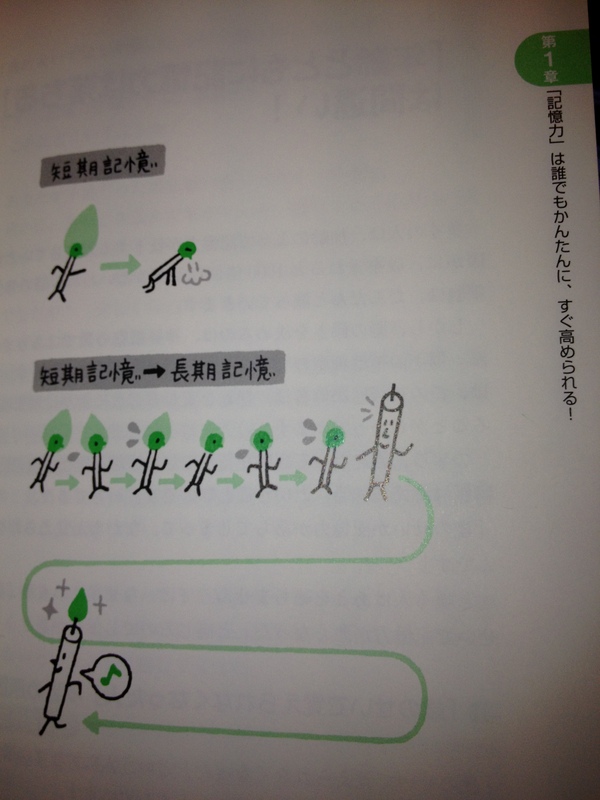 Reading about these methods reinforces both the positive advice and Japanese itself. In learning a foreign language there is a time for pushing and a time for relaxing into the language. Both are important. 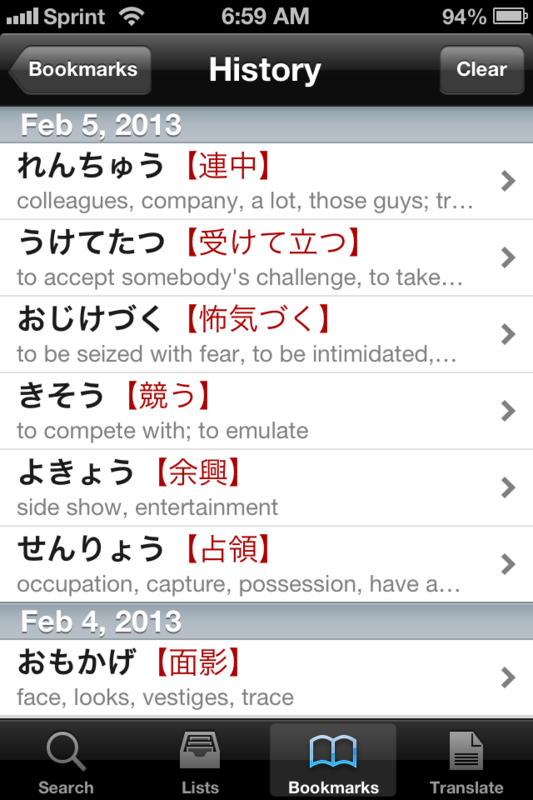 I push by making new flashcards, reading definitions of Japanese words in Japanese, and studying flashcards. I relax into the Japanese by listening to Japanese music, television, movies and by random channel and web surfing. I’m not “fluent” yet but I consider it a milestone that I just read Japanese books for fun now. Don’t give up on your dream of learning a foreign language. Take a minute to have some fun. Support Samuraimindonline.com. Consider donating towards the web hosting fees by following the link on the bottom right. Or visit the store and get something nice for yourself. A small portion goes to samuraimindonline. Remember, a samurai mind is a terrible thing to waste! Thanks for visiting! always be on the look out for smart short cuts or opportunities for deliberate practice. Khatzumoto has some key questions in his article, “Practice Time, Game Time” that I think can apply to any field: What don’t I know well? What doesn’t work? What needs fixing? What can be improved? (Talent is Overrated is a great book to think about this whole idea of deliberate practice.) Heisig realized that understanding kanji would really propel his Japanese fluency and invented a whole system around it. have fun. Happy feelings bring happy learnings. Heisig hightailed it from the language school as soon as he could and went to the mountains of Nagano and said he learned a lot of Japanese by playing with children and reading comic books. Give yourself the edge. Be bold and independent but also look at all the resources that are available and be persistent about evaluating them. And above all have fun and enjoy the journey. Another great tool is anki.ichi.net, which allows you to create flashcards for anything that you are learning. As you pass and fail cards, they come up in a spaced repetition system, so you are mostly reviewing things at the edge of forgetting and remembering. SRS systems are a great way to give yourself an edge. This interview originally appeared in kanjiclinic.com, a great resource for learning more about kanji. Every now and then, someone confronts their own personal challenge, systematically overcomes it, and then shares that system with the world. This not only opens up their world, but also opens up the world for generations of people to come. James W. Heisig, author of the sometimes controversial book Remembering the Kanji I: A Complete Course on How Not to Forget the Meaning and Writing of Japanese Characters, is definitely one of those people. Many people refer to his approach to learning to write the complex Japanese characters as “revolutionary,” making Japanese and kanji study accessible to their lives and opening up a whole world of learning and possibilities for them. I conducted a telephone interview with Prof. Heisig from his office at the Nanzan University Institute for Religion and Culture in Nagoya, Japan. The time that you can wake up to what you can do is now. As you follow your dreams and learn what you’ve always wanted to learn you need persistence. You also need to bob and weave. You can change your materials and your learning approaches like a time shifting ninja. I’ve been taking photographs of pages from books that I find inspirational or interesting. This is from Kenichiro Mogi’s Japanese book, “Only Do Good Things With Your Brain.” This phrase here means that developing happiness helps your brain grow. Happiness, learning, happiness. A non-vicious cycle. Check your breathing and your posture. Open up. Breathe deep. Be gentle with yourself. Do you point and laugh at children that are learning how to walk? On the other hand, don”t try to bliss out. You don’t have to motivate yourself to do what is odious to you. Put that Napalm for Idiots book in the trash. You don”t have to know every fact or keep every flashcard. Choice is a loving act. The other day, I was looking at my Samurai notebook and really feeling resistant about looking at it. I had been resisting looking at it for days. Part of the reason I was feeling this resistance was because I had filled my journal with “obligatory” notes from online courses from my job, etc. I realized this recently smiled, took relaxed breath and a looked at one of the positive goals in my Samurai notebook and turned a chore into a joy and challenge. I also made a decision to quickly skip over things that didn’t interest me at the moment. My samurai reviews have been going better ever since. In one of Khatzumoto’s emails as part of my Silverspoon (a Japanese immersion service) experience he writes something like, “don’t focus on being so negative. It won’t work anyway.” (Khatzumoto sends out emails containing both an inspirational quote—sometimes brutal, sometimes sublime, sometimes cheesy. ) In the daily “sprints,” Khatzumoto asks that you do what I would call an affirmation (though I think the youngster would probably choose a “hipper” phrase.) “Why do I choose to touch Japanese every day” is just one example. 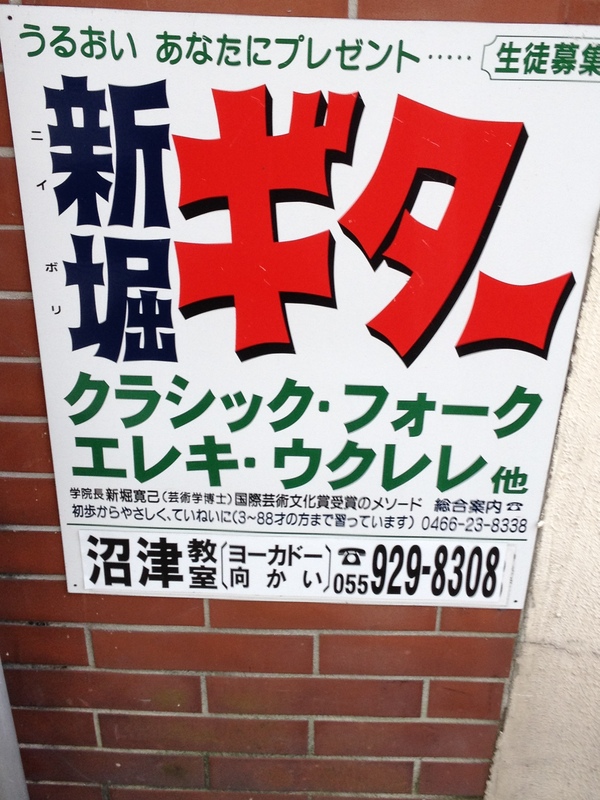 A sign for guitar classes in Numazu. 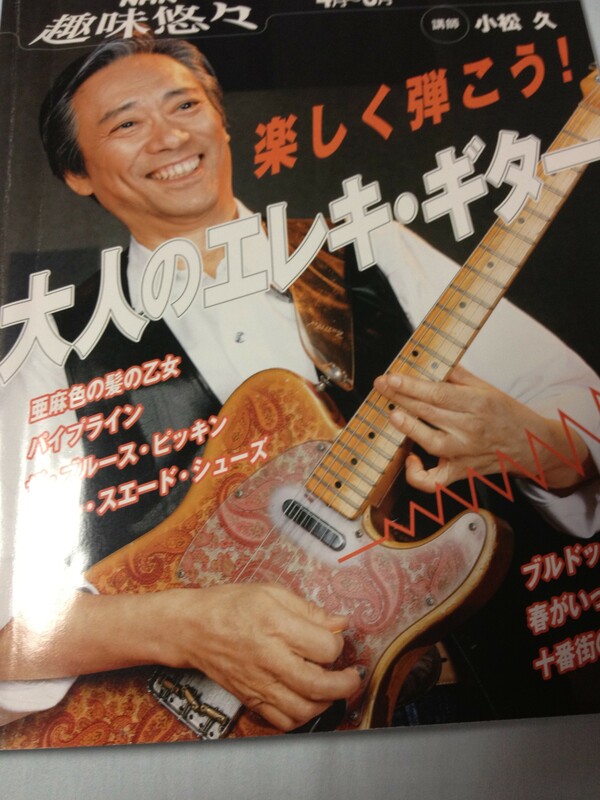 I want to take guitar classes and study how to play guitar with Japanese materials. Use what you love to learn. Loving two birds with no stone! Take a look around you, inside of you. What seems impossible? What’s one little step you can take. Breathe. Smile. Open a new page. Samurai reading is samurai singing. Samurai singing is samurai learning. Love what you learn and learn what you love. Bored or frustrated with what you are learning? Here are two options: change what you are learning or change your mind. As I went through the cards, I noticed that I was really remembering the cards I had some fond, personal connection to rather than the cards I just collected by more formal ‘studying.’ I remembered that どじょう　was loach fish (wth?) because it was a word I had collected while my daughter was singing karaoke with my father-in-law. I could picture the cartoon face. Last night I looked up ひやひや (chilly or fearful) and can remember that it was a word a Japanese ping pong player used to describe her team’s close game. It’s a non-vicious cycle. Turn to the things that you want to learn and master (guitar, economics, starting your own business, the interwebs) and it makes it easier to learn. Turn to the things that you love, and it will help you learn (and do) more. 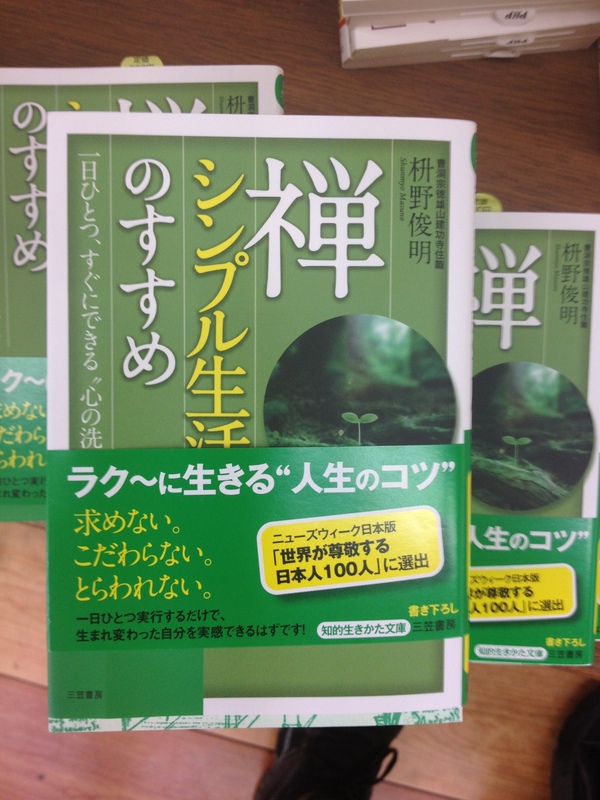 My Japanese ‘studies’ improved when I decided to use it to read self-help books, my guilty pleasure. Change what you are learning or change your mind. Change it up. AJATT has a hilarious post called, ‘That Righteous Feeling, Or: If You’re Not Feeling Naughty, You’re Doing It Wrong.’ Khatzumoto basically argues that if you are reading a book in your target language out of duty or obligation instead of fun, you are actually hurting your learning efficiency. I think this is true even if you aren’t learning a language. I think it’s also possible to change your mind about what you are learning and ask what’s the fun in this? Sometimes I get a lot more out of just reading the table of contents of a Japanese book rather than boring myself by struggling through every page and killing my desire to read. Everything is fair in love, reading, and learning. 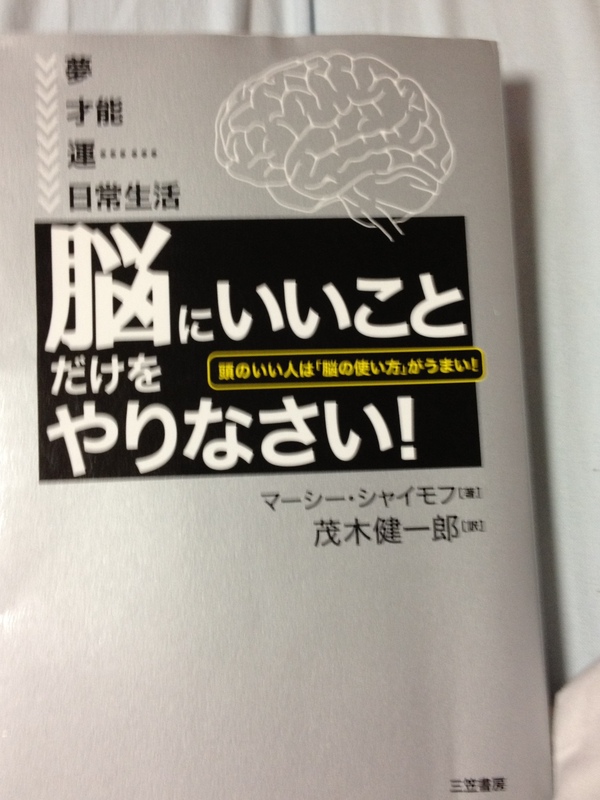 Kenichiro Mogi, author of several books on the the brain　（ 脳）　loves to talk about the dopamine effect. He explains that overcoming mental hurdles and challenges releases endorphins and dopamine that create feelings of happiness. It’s why some people love video games, mountain climbing and even algebra. Learn what you love and love what you learn. Become the Jimi Hendrix of your life. 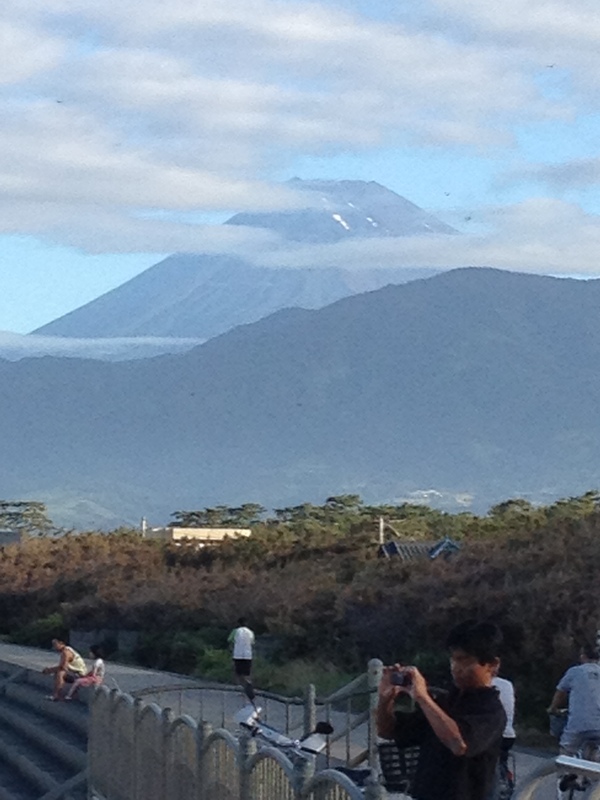 Climb the mountain! 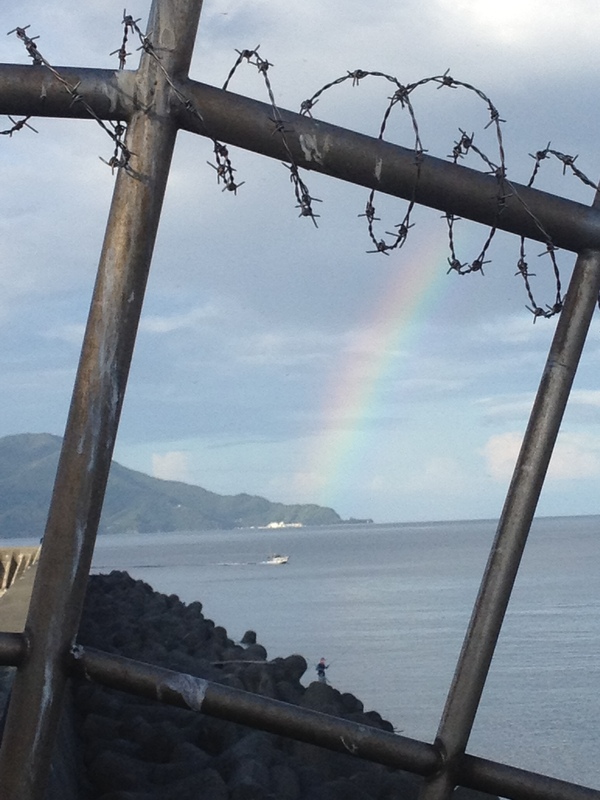 Catch the rainbow!